Hot Lead and Cold Hexes! 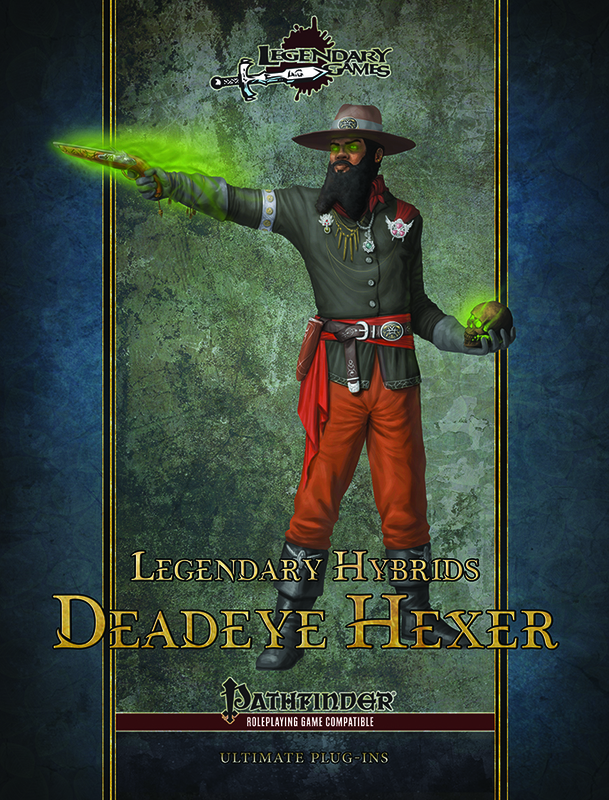 Legendary Hybrids: Deadeye Hexer is the latest volume in our series of class-focused player supplements, introducing a new series of hybrid classes like those in the Pathfinder Roleplaying Game Advanced Class Guide that blend the core elements of two different base classes into a unique synergy all their own. The deadeye hexer brings you a 20-level hybrid class that combines the mysterious magical arts of witchcraft with a gunslinger's fearsome focus on firearms. A lethal loner with a fell reputation, a deadeye hexer's merest glance causes enemies to quail before him as he hurls hot lead and harrowing hexes with equal authority. Where witches commune with the spirits through the natural world, a deadeye hexer's silent companion is his steely peacemaker. Through it he hears the cold and brutal whispers of an uncaring universe that unfold to him the harsh truths of fate and grant him the power to bring final judgment to whomever lands in his sights. Grab this 28-page new Pathfinder 20-level character class supplement and Make Your Game Legendary!